I grew up in a time when the only cherries my family had were the ones we picked ourselves from my Grandmother’s trees. She had two trees, one Bing and one Royal Anne. I loved those trees. I would stand underneath it in rapture at *ALL* those cherries of mine. Mine. Mine-mine-mine-mine. Megidtyfregity birds stealing my jewels at the top. Just because I was afraid of heights and couldn’t reach them didn’t mean they weren’t mine. 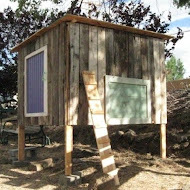 During cherry season I’d say to my Grandma, “I’m going for a walk.” She’d reply, “Janet….don’t eat a lot of cherries, you’ll be too full for dinner!” It’s okay - I knew she would love me anyway. I’d lie if I had to….because there were cherries in their prime out on the side of the farmhouse. I was a weak girl. I picked up some Bings from a grocery store this week (gasp) due to their appealing price. As suspected they were not prime. The farmers market had some this past week, though the Royal Anne’s looked a little bruised from travel. I have such fond memories of how gorgeous they are right of my Grandmother’s tree, so I pass when I find them on the bruised side. What I had on hand mid-week were the Make Do Bings. They needed a little help. The color was there, but not the depth of flavor, so that meant help in the form of putting them in baked goods. There is a lemon pound cake recipe from Lori Longbotham's book all over the food web as an adapted recipe. I’m not sure what has been adapted because it’s not been changed from what I can find. It is a lovely lemon cake. I have made her recipe in the past and it is a fine one as is. I wanted a different result in texture with fruit added to it. 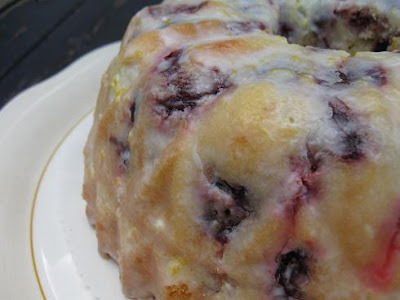 I wanted a finer crumb that would be able to take some fruit, and because of the fresh fruit, I didn’t want the soaking method at the end of the original recipe. I went with a more concentrated lemon flavor on the exterior, provided by a glaze. 1 - 1 ½ c. cherries, pitted. Either halved or quartered. Cream the butter and sugar. Whip it good, get ’er fluffy. Add the eggs one at a time, scraping the bowl before adding the next. Alternate the milk and the flour mixture, in thirds, ending with the milk. Remove from the mixer, then add the zest. If you used the whip attachment and you have a KitchenAid, then you know that zest gets caught in that cross section at the bottom…bothersome, isn’t it? Scoop batter into preferred pan of choice - any 12 c. bundt style pan. Bake at 325 degrees for 1 ¼ - 1 ½ hours, start checking at 75 minutes. A consistency a little thicker than maple syrup or heavy whipping cream, will give you a coating that doesn’t run off. If you prefer a thinner glaze, that is lovely too. I posted the various pictures so you see the difference in glazes. The first picture is dusted with powdered sugar. 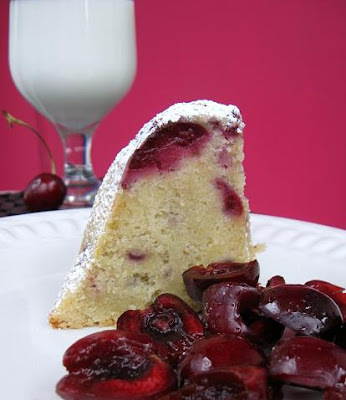 If you quarter the cherries -- just before adding to the batter, sprinkle them with flour. This give the perception they will not settle towards the bottom, but they do anyway. Ha. It’s a soft batter - what can one expect? You could chop the cherries, but then miss impact of cherry flavor biting into a chunk. Using a baking spray such as Baker’s Joy will give a better outer crumb than butter and flour - for the most part. This cake looks absolutely delicious. 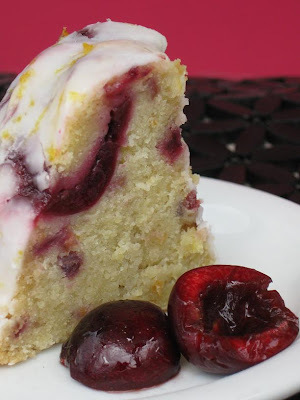 I love finding good recipes that make use of fresh cherries. Just found your blog and like it very much!